AirPlay allows iPhone users to wirelessly broadcast photos, videos and more to their TV without the need for wires. Here’s how to use AirPlay (and AirPlay 2) in iOS 11 and more. The iPhone is a powerful handheld device that enables you to view, edit and play many of the files you’d normally see on a computer. You can take photographs, watch videos, play music and create business documents right from the palm of your hand. But although even the iPhone X has its gorgeous 5.8in display and an immaculate stereo speaker setup, there are times when you want to send its audio or video to a really big screen. 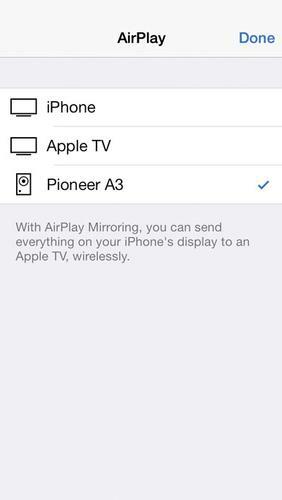 In this article we explain what AirPlay is, and how to use the wireless technology on an iPhone or iPad. 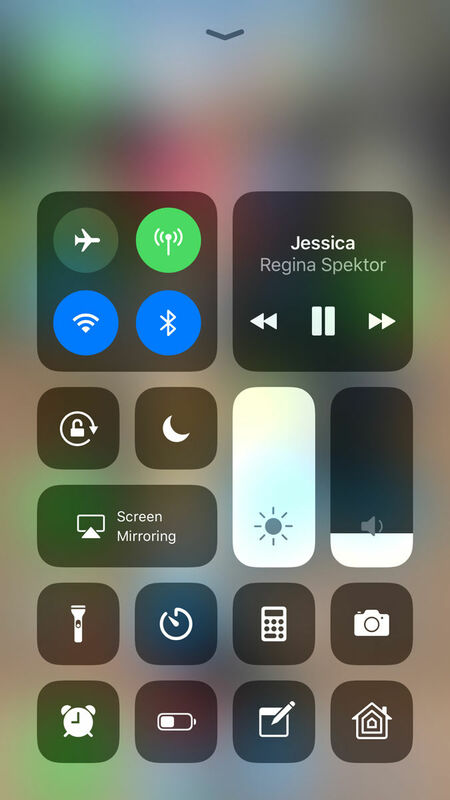 Essentially, AirPlay works via Wi-Fi, connecting AirPlay-compatible devices together, allowing you to wirelessly stream music amongst other things. There are two kinds of receiver: an AirPlay Speaker (which now includes the HomePod), or an Apple TV. While the AirPlay speaker will provide users with wireless audio playback, we’d argue that AirPlay doesn’t really step into its own until used with an Apple TV. The addition of an Apple TV can turn any ‘dumb’ TV into a smart one, and if you haven’t got one already, you can pick one up from Apple starting at £149 or $149. AirPlay 2 is the first major update to the AirPlay standard, and was announced at WWDC in summer 2017 – but as of 23 Apr 2018 it still hasn’t launched to the general public. We hope that will change soon, and we’re pleased to report that it looks like it will. AirPlay 2 was included in the first two betas of iOS 11.3 (and its companion tvOS 11.3) but as of the third beta it had vanished. We’ve now seen the first beta of iOS 11.4, and it’s back again, with an additional feature. 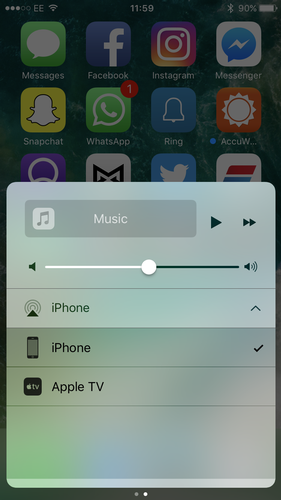 AirPlay 2 in iOS 11.4 beta also enables you to control the volume of speakers in different rooms separately, which wasn’t possible in the version in early betas of iOS 11.3. As long as you’ve got an Apple TV or AirPlay-enabled speaker, here’s how to use AirPlay in iOS 11. 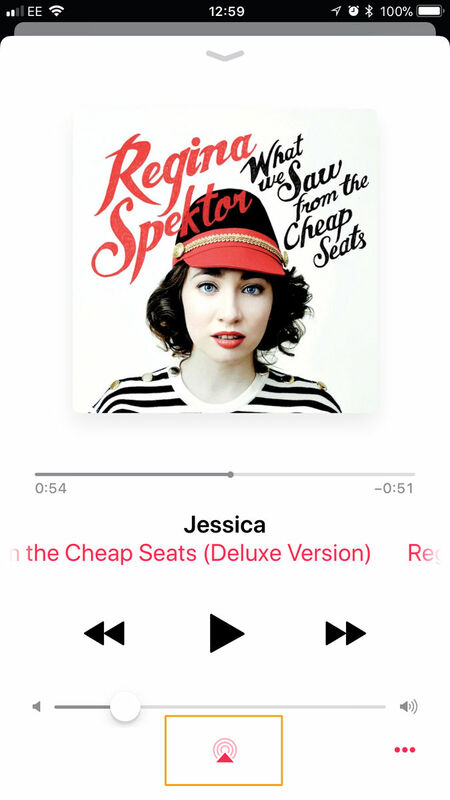 If you want music, photos or videos to be displayed elsewhere, you’ll need to connect to AirPlay. The way you do this varies from app to app, but you’ll generally be looking for a button labelled AirPlay or Screen Mirroring, or an AirPlay logo (a triangle with circular waves emanating from its tip, or a triangle with a square at the top). In some other apps, such as Photos, you’ll need to tap the Sharing button – that’s the square with an arrow pointing out of it. Then tap AirPlay and select a device. If you’re running iOS 9 or earlier, you’ll need to be aware of one or two further differences. It’s worth noting that if it’s the first time you’re connecting to the Apple TV via AirPlay, you’ll be asked to input a code that’s displayed on the TV. The process for mirroring your display in iOS 9 or earlier is almost the exact same as in iOS 10, but with one extra step. 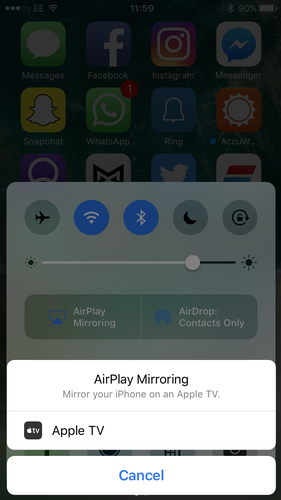 As with iOS 10, swipe up to access the Control Centre, tap AirPlay, select the device you’d like to mirror your display to and make sure that ‘Mirroring’ is toggled on.